By the end of Haydn’s life there existed no less than three versions of this mass, and even more names it was known by. Originally orchestrated for strings, three trumpets and organ, due to its popularity Haydn added flutes, oboes and horns. We are performing Haydn’s original orchestration, how it would have been performed for Prince Esterhazy who retained Haydn as his composer in residence for much of his life. Written for the annual celebrations of St Cecilia’s Day, Purcell’s Te Deum and Jubilate were first performed in 1694 in St Bride’s Church, Fleet Street. Alongside a string orchestra, Purcell included two trumpets, adding to the celebratory atmosphere of this musical gem. 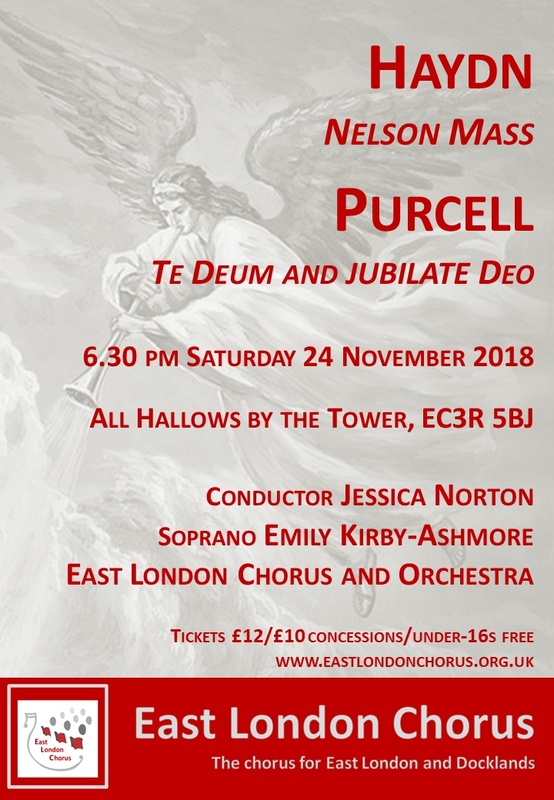 Come along to All Hallows by the Tower on Saturday 24th November to enjoy these contrasting pieces, performed by the East London Chorus and Orchestra.